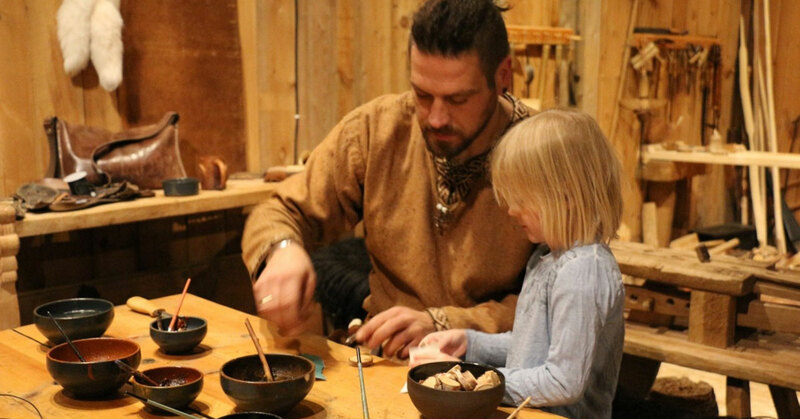 ​Would you like to participate in fun activities in the Viking Age? Open: Monday - Saturday, 1200 - 1600. Visits outside opening hours: book in advance (groups). Viking feast every night (must be booked in advance) 1830 - 2100. Open: Every day, 1000 - 1700 (also on holidays). From May 1st, the museum is open every day. In May, the farm animals will be moved to the pasture as soon as the weather permits it. The Viking ship will be put out approx. mid-May, more craftsmen arrive and we start to get ready for the summer. From June 15th, there are many extra activities again. Welcome! On the journey, you will learn a little about textiles and other materials used for furniture, machines and other things. Was it just as easy in the past as nowadays just buying new things? Or is it possible to repair and renew clothes and equipment by choosing the right materials? Participants are invited through an interactive rune journey through several stations in the longhouse to try, touch and look around. Perhaps it will create wonder and understanding of the changes that have occurred over the 1000 years that have passed since the Viking Age? You get a piece of leather which you can engrave with your name, drawings, patterns or other. For the drawing, we use antlers of deer. Afterwards you can use the bookmark at home in the boks you are reading. We bake thin-bread over the bonfire, flavor it with butter, berries, and honey and enjoy the finished result. Yum! Participants get their own amulet. You have to brush the surface of the amulet yourself, then choose color and motif to decorate it with. Learn to play the Vikings' popular board game Hnefatafl. This is a fun activity for the whole family. The prize for the right solution is to fry a pancake over the fire in the hearth. We play outdoors if weather permits it: axe-throwing, tug of war. Alternatively, we do challanging balance games inside the longhouse instead if the weather requires it.